Since diesel became a dirty word, new investment opportunities have been growing. European capitals, such as Paris, have indicated that diesel power will be banned completely by 20301. Meanwhile, London will increase the ultra-low emissions zone in 2021, and require all taxis and private hire vehicles to be zero-emissions2. The reasons are clear. Air pollution is a health crisis, shortening life expectancy by damaging lungs and worsening chronic illnesses. London has experienced illegal levels of air pollution since 20103. Meanwhile, the majority of Britain’s climate change emissions come from transport4, with petrol and diesel cars as the main source. The search for alternative, cleaner fuels has intensified, with electric battery-powered and hydrogen fuel cell vehicles leading the way as viable options. But which is best? EVs currently represent a small percentage of vehicles sold5, despite many options being on the market, from the high-end Jaguar I-Pace to the more affordable Nissan Leaf. However, companies are investing large sums in developing them further, to make them a more attractive, mainstream choice. Coming to market in 2022 will be the Volkswagen I.D. Buzz, a revamp of the iconic minibus, and the Tesla Model Y SUV which CEO Elon Musk has described as a “manufacturing revolution.” Dyson have just announced they will be developing an EV too, ready for a 2021 launch6. EVs can be charged from home, many now offering up to 300 miles of driving. 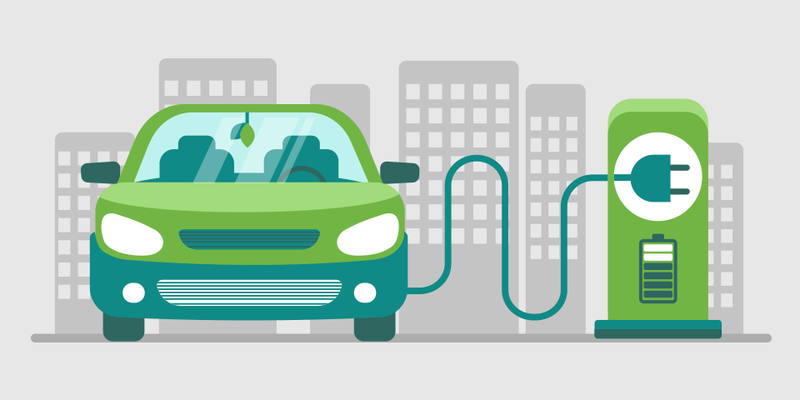 The infrastructure for charge points, at home, work or out and about, is simple to provide. However the key deterrent for electric cars remains the time required to charge the battery, which can vary between 30 minutes and 12 hours. It is for this reason that hybrid vehicles, combining a petrol engine with electric capability, remain popular – they could allow a driver to switch on zero-emissions modes whilst crossing city centres for example, but offer a much longer, easily refuelled drive time by using petrol elsewhere. An eco-concern with EVs is the battery. Made from lithium-ion, they are energy-intensive to produce, requiring approximately 20 tonnes of carbon dioxide7 (that much carbon fuels more than four years driving for the average vehicle8). At the moment, freezing temperatures can make charging a problem, as well as sapping battery power. It is also important to note that whilst an electric car has zero-emissions at point of use, in terms of climate change, it is still only as green as the electricity used to charge it. With only 28% of electric power coming from renewable sources9, eco-minded drivers may wish to investigate green energy providers and renewable options for their home. To the average driver, HFCVs can sound like a futuristic option, but they are increasingly considered to be the viable alternative to electric. They work in a similar way to an internal-combustion engine, but instead of burning petrol or diesel, they use pressurised hydrogen gas. The fuel cell fuses the hydrogen with oxygen from the air to make water and release electricity. The only waste product is pure water (so clean it is drinkable) and the engines are silent. Hydrogen is readily available as a fuel source. It’s found in plants, manure and water and is the most abundant chemical element, making up roughly 75% of the matter of the universe. Extracting it requires high school science – many of us may remember electrolysis – which uses an electrical current to split the water into its parts (hydrogen and oxygen). However, for commercial use, hydrogen is usually extracted through steam reforming of methane. Methane is made up of one atom of carbon with four of hydrogen. When methane gas is combined with high-temperature steam (ideally heated using solar), a reaction is triggered that separates the hydrogen, which is then collected. Most methane comes from natural gas, but renewable sources can be used, such as gases from landfill or biomass. Hydrogen power is widely considered to be the cleanest and greenest power source for transport yet. Manufacturers leading the way are Toyota, Honda and Hyundai. For example, the Toyota Mirai is hailed as the world’s first mass-produced HFCV10, built with the architecture of the Prius. Still, even with a government grant, it retails at over £60,000. There have been challenges, including tank safety. With gas fuel, it is harder to ensure it doesn’t leak or become compromised in a crash. Toyota engineers have addressed this with a three-layer structure of carbon fibre-wrapped, polymer linings. An advantage of hydrogen, over electric, is that HFCVs fill up in much the same way as with conventional fuel – except the seal must be airtight. Like a typical trip to the fuel pump, roughly three to five minutes fuelling will give 300 miles driving. If this all sounds too good to be true, that is because, currently, it is. If you bought a Mirai today, your main issue would be where to source your fuel. With roughly 30 hydrogen pumps in the UK, mostly in the London area, the majority of us would struggle. There is currently very little infrastructure to support the fuelling of hydrogen vehicles. David Hart, of sustainable energy consultant E4Tech agrees, predicting that we could be looking at millions to tens of millions of hydrogen cars by 204012. Many of these could be electric-hydrogen hybrids, because the petrol drivetrain of hybrid cars is easily replaced with hydrogen fuel cells. Hybrids could provide an interim step, while the infrastructure is developed. Sustainable transport, such as EV technology, is an investment theme in Holden and Partners’ client portfolios. Our Ethical, Sustainable and Thematic fund managers tend not to own the automobile producers themselves, due to the increasingly fierce competitive landscape for EVs (and eventually HFCVs), but instead focus on specialised producers of components and software further up the supply chain. These tend to have greater barriers to entry and can sell their product to any number of end-producers. Examples include TE Connectivity which is held within the Wheb Sustainability fund. TE is a leader in the connectors and sensors industry, using electronic components, network solutions and wireless systems to improve safety as well as fuel and energy efficiency in the automotive industry and other markets. Also, Delphi Technologies, which is held within the Pictet Global Environmental Opportunities fund. Delphi focuses on intelligent driving and advance propulsion systems, which means they contribute to safer, as well as cleaner, automotive technologies. Right now, the choice between electric and hydrogen is a simple one for consumers; electric is a real, practical option, whilst hydrogen still seems like a unicorn – just a lovely fantasy. Nevertheless, the potential for hydrogen is immense and growing in likelihood all the time. It offers a truly sustainable fuelling approach, with the avoidance of batteries. The future for transport is looking ever greener and cleaner.